Time to Play: 10-30 Min. Experience the adventure of exploring unknown islands! Each game presents new and unique challenges, for the board is different every time you play. In the 2-player variant, you and your opponent seek to claim the biggest islands in Oceania. The most successful explorer is the victor! Or you can be your own opponent in the solo variant. You will seek out larger, more valuable islands as the game challenges you to beat your own record score! 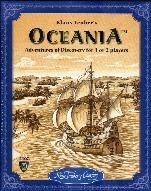 Oceania is the smaller - but no less exciting - brother of the classic Klaus Teuber game Entdecker.